(SR5) First pictures of the Sony NEX3 camera! We just received the two pictures from an anonymous sender. He spotted the Sony mirrorless camera inside an asian pub! The pictures shows the Sony NEX3. The lens is the 16mm f/2.8 pancake lens. As we told you days ago the lens is chrome finished and has a diameter of 49mm. The lens is bigger than the Olympus 17mm f/2.8 Lens (37mm) and the Panasonic 20mm f/1.7 (42mm) . 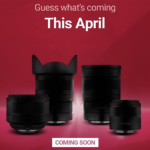 Reminder: We expect two Sony mirrorless cameras to be announced on May 11. 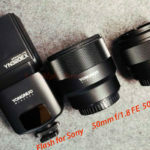 The NEX3 and the NEX5 will be very similar. There will be only minor differences between the two mirrorless cameras (The NEX5 has faster FPS and 1080p recording, the NEX3 720p). 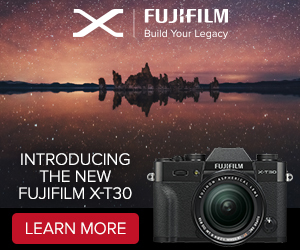 Both will be very aggressively priced compared to MicroFourThirds cameras . Both cameras will feature the new 14 Megapixel Sony ExmorHD sensor. 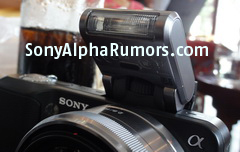 You asked me to update you about the long awaited Sony Alpha firmware update. One of my trusted soruces confirmed once again that in will come in May. 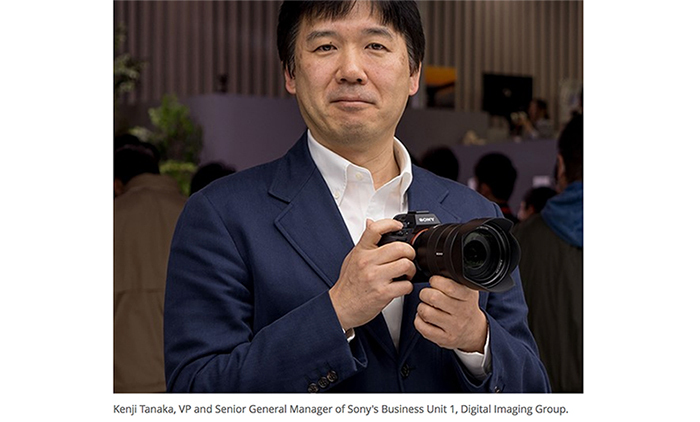 According to informations we received the Sony NEX cameras will be sold with an optional optical viewfinder. We have no details yet, but we are certain the viewfinder is not electronic!!! The Panasonic GF1 and the Olympus E-PL1/E-P2 do have electronic viewfinder . 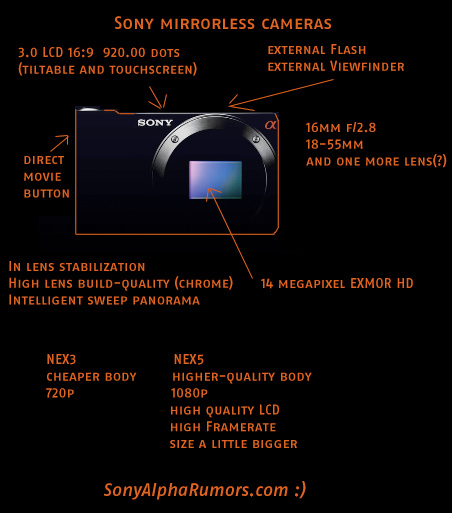 I made a small summary of alle the recent Sony mirrorless rumored specifications. All I am writing here doesn’t come from Sony, this are just “rumors” we collected and received from you. I expect most of the informations to be true but small changes can still be possible. 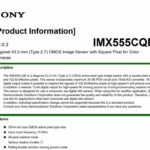 Since weeks we are receiving pieces and pieces of informations about the Sony NEX cameras. According to informations we collected most of the dealers and photographers who have seen the cameras have been very positive impressed by the cameras. 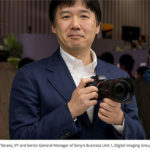 Sony will present the NEX3 and the NEX5. The first thing people noticed is that the camera is incredible thin! Someone told me that it is thin like his index finger. The NEX3 and NEX5 are more compact than every digital Olympus PEN made to date. The NEX3 has a plastic body and the NEX5 has a metal+plastic body. The NEX3 records 720p and the NEX5 1080p. Both do have the same 14 Megapixel EXmor sensor. The NEX cameras do not have built-in image stabilization and no built-in flash. They have a hotshoe and an external flash (included into the kit-box). The LCD display is tiltable. It is even better than the screen from the Sony A550 LCD. There will be two kit zooms and one pancake. 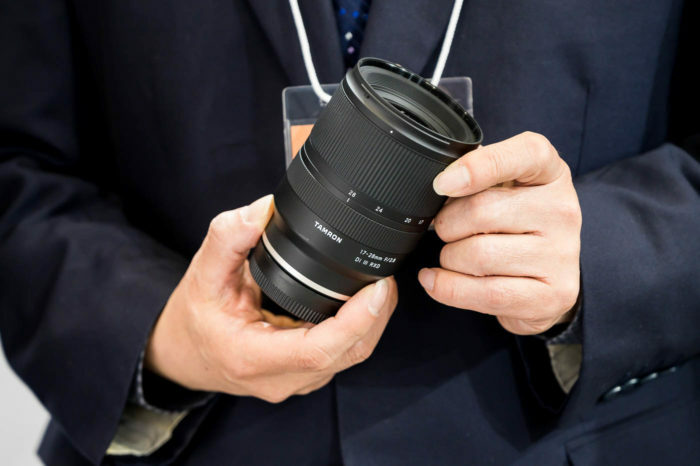 Compared to MicroFourThirds lenses they are a little big bigger. Even the 16mm f/2.8 pancake is bigger than the Olympus 17mm f/2.8 Lens lens. But the Olympus lens is made by cheap plastic. Sony lenses are very well built (Chrome). – This are rumors (sent by anonymous sources or found on worldwide forums) and not official Sony news. – We also try to double check the rumors we recieve. So if you send us some infos do not expect them to be published quickly. as you can imagine I am receiving many emails with “rumors”. And only few of them are probably correct. So don’t be angry with me if I don’t post a rumor you send me. I need to check everything I get before to publish it. One thing I noticed is that it seems that many people do believe the real camera name won’t be Sony Alpha NEX but something else…like for example Sony Alpha GP. Have no idea why many of you do believe that. If you find something interesting on forums or somewhere else please send me an email at sonyalpharumors@gmail.com. Thanks! Reminder: You can also follow us on facebook.com! 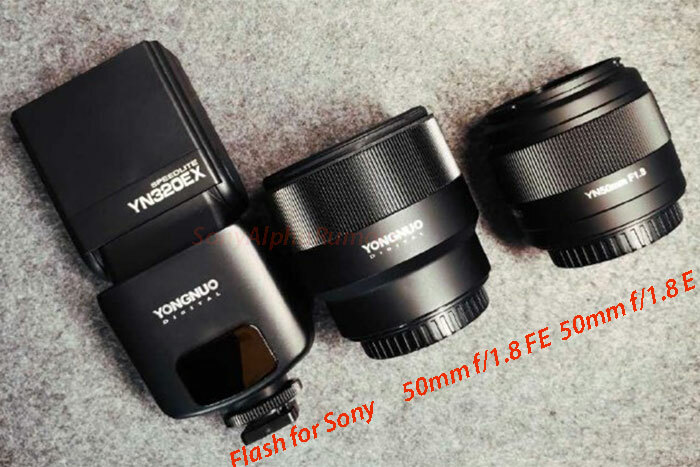 Based on the rumors we received we tought it would be nice to make a simple comparison table between the future Sony NEX cameras and the compact MicroFourThirds models.